…And I don’t know about you but wearing four layers of clothing and STILL having my muscles clenched against the cold is getting old, real old. Here are some of the highlights of the week in business. HSU’S ECONOMIC REPORT compiled by the ever-helpful Dr Erich Escher shows a mixed bag of indicators; Housing prices are up, but sales are down. Gas prices are in decline also, note the $3.70 ranges in the report, although I just saw $3.54 at COSTCO. Read the whole report; this is a resource we are lucky to have. SINGLETON STRIKES AGAIN: According to the Mad River Union, it was an ADA lawsuit filed by Mr Singleton that caused the closure of Arcata’s branch of Porter Street Barbecue. I don’t know why business owners can’t get it through their heads that after 30 years the ADA is not going away, but there you go. Unfortunately, the food at their Eureka store has declined considerably. The last few times I had their chili, it contained a spongy meatlike substance that almost seemed like stomach tissue or tripe. I’m sure it’s legal but sure isn’t very appetizing. When, oh when, will someone open a REAL barbecue here? But then I’m a Carolina girl. I’ve had the real stuff. There is voluminous guidance from the State and from employers’ group on meeting ADA/FEHA standards and it’s not all that hard to understand. If only our city and county permit processes incorporated the ADA requirements, no one would have to be surprised after they’ve already spent money. I’ve been hearing this same complaint for years. This is a wasteful and expensive way to do business and it doesn’t have to be this way. I notice that the Wendy’s in Eureka which previously closed allegedly due to some sort of ADA issues is hiring and getting ready to open for business again. Maybe they’ve learned something. ANNALS OF GREED, or It Must Be Nice Dept: Republican State Senator Bill Emmerson of Redlands resigned his seat and a week later was named a senior vice president of the California Hospital Association “where he will oversee the group’s in-house and contract lobbyists. ” Every State employee is drilled on the requirement that a year must pass before conversations that might be construed as lobbying can take place but by the subterfuge of having him “oversee” the effort, he’s free to pursue the best interests of the CHA, which are not necessarily in the best interests of our citizens. Former Sen, Michael Rubio did similarly a few months ago, working now for Chevron. CALTRAIN NEWS: The CalTrain Board has announced that daily ridership is now in the 50,000 range, up from 30,000 ten years ago. CalTrain is also installing racks and other equipment to encourage cyclists to come aboard. All good news. I’m going to stop now because this has really been a horrible week of homicides, deaths by fire and generally un-holidayish happenings. Maybe next week will be better? Let’s hope so. See ya at the Truckers’ Parade Saturday evening. This post would have been published Tuesday but technical problems intervened, so you’ve probably heard most of this already. As everyone not living in a cave knows, BevMo, the behemoth liquor successor to Beverages and More, is opening in Eureka this morning (Oct 18) at 9am, across from Eureka Natural Foods. Free BBQ lunch from 12-1. As a point of civic pride I hope there is NOT a long line waiting at 9am. The company was started in 1994, according to Wikipedia and has had a somewhat turbulent history of trademark disputes and false starts; they nearly went broke after over-ambitious expansions into Nevada and Florida before pulling back and concentrating on California, Arizona and Washington. The Eureka store will be their 149th and with each store employing an average of 17 workers, they have a workforce of over 2500 people, including Willard Wong, cellar master, who writes a wine blog on the company’s own website. They have a membership program and wine tastings. This is a bigtime company entering a small market. How will our small local stores be affected? One of their opening specials is Lagunitas IPA, sale price $12.99 for a 12-pack. Murphy’s carries it right now for $14.99. This may be the pattern, prices low enough to catch your attention but not enough to make a special trip for. The government figures it costs you $.56 per mile to operate your car, so it may or may not pencil out in your case. They will have tastings and events to draw you in and this Wednesday’s Times-Standard has a coupon, $10 off your purchase of $50 or more. I don’t buy $50 worth of liquor in a year so I’m probably not the right person to write about this. l buy a bottle of Cherry Heering for about $30 once in a while and have only been able to find it at John’s Liquors on Myrtle. I’ll be curious to see if BevMo carries it. They probably do, and I’ll probably keep going to John’s. I don’t know for sure, but the arrival of BevMo may have impacted the future of the Henderson Center Marketplace that is/was planned for the old Robert’s site. Wine tasting was going to be featured there, also, but the site lays empty. Neighborhood gossip is that the partnership behind the HCM has unravelled and the proposed operator has left town. Realtor Mark Burtchett, whose name is first on the liquor license, did not return my call or my email, which is not a good sign. Mr. Burtchett, we’re all pulling for you. Henderson Center needs a bit of BevMo. 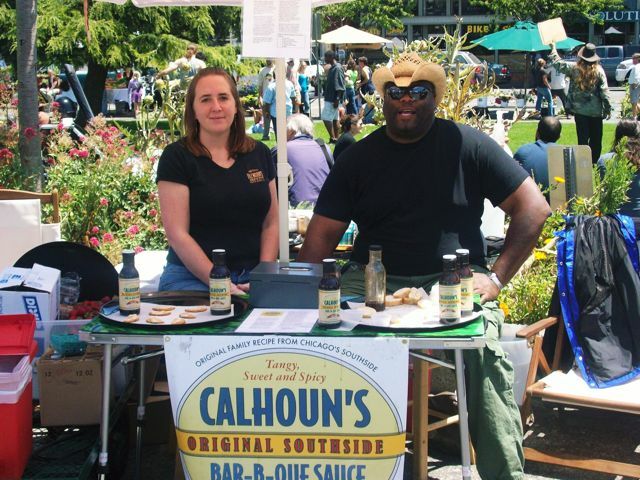 Is Calhoun’s the best barbecue sauce ever? I am making no attempt whatsoever to be objective. From the moment I discovered Calhoun’s (probably at Murphy’s) I have never purchased another brand. I’ve tried barbeque sauces all over the Carolinas and Florida, and in St. Louis, and even the mustard sauce peculiar to South Carolina, which most Californians can’t stand. 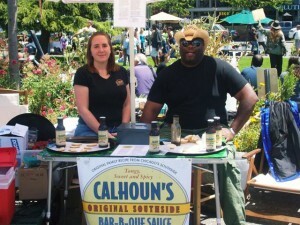 But my go-to sauce, which I always keep on hand, is Calhoun’s Original Southside Bar-B-Cue Sauce. It’s light and slightly spicy, not sticky-sweet like the Memphis style. As Mike Ross, its creator, explains it, there is no real “Chicago Style” sauce; he had to invent it himself. Talking to Mike Ross is a treat, especially if you love Chicago as I do. Mike grew up in what is now known as the “Historic Pullman District”. Historic it is, and you can sign up for tours which will guide you through the first model, planned industrial community in the United States, built by George Pullman as a place to produce the famous Pullman sleeping car. It was a company town, sort of like Scotia on steroids, and the scene of a violent strike in 1894. Mike grew up grilling for family get-togethers (oh, those Chicago summer evenings!) 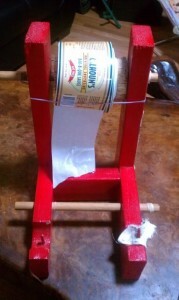 and his sauce recipe had its beginnings there. The name “Calhoun’s” , incidentally, derives from the neighborhood’s Calhoun Street. Mike worked as a correctional officer for 12 years before deciding that Chicago had become too small and a change was in order. He came to Arcata to visit his grandparents who had moved there earlier. Once he hit the tarmac and saw the green hills around, he never looked back. The business is clearly poised for expansion. Mike is travelling to Georgia to pick up a catering-size grill and smoker and looks forward to opening his own place. Meanwhile, a distribution deal is pending with a partner in, of all places, Montreal, which has a long barbecue tradition of its own, especially with chicken. He currently has seventeen outlets including Murphy’s Markets and Eureka Natural Foods but if the Canadian connection works out, watch for explosive growth. With all-natural ingredients, Calhoun’s may become the Redwood Coast’s next big export. Visit their website here. Have you tried Calhoun’s? How do you think it stacks up next to Smokin’ Moses or whatever they use at Porter Street? Have you worked with the SBDC or AEDC? Let us hear from you!